Following up on the blog post looking at the media coverage of E3 and gamescom, I wanted to do one on the “September Events”. The month was rich in games industry events, and I want to try to keep this series of articles as regular as possible to provide more context around the benefits of attending different events, from a media/PR point of view. As usual, you can read about the tool and methodology here. And take this with a pinch of salt, as always. Media coverage shouldn’t be the only reason to attend any event. And it’s also sometimes beneficial to be the biggest announcement of a smaller event rather than one-in-a-million at E3. Going by chronological order, the PAX main event (even if it is getting challenged by PAX East), renamed PAX West this year after being PAX Prime for so long, took place early September in Seattle. Collecting data prior to 2015 proved complicated this time around, so I only look at this year and the previous one. Overall coverage is lower, but stayed in the same order of magnitude. 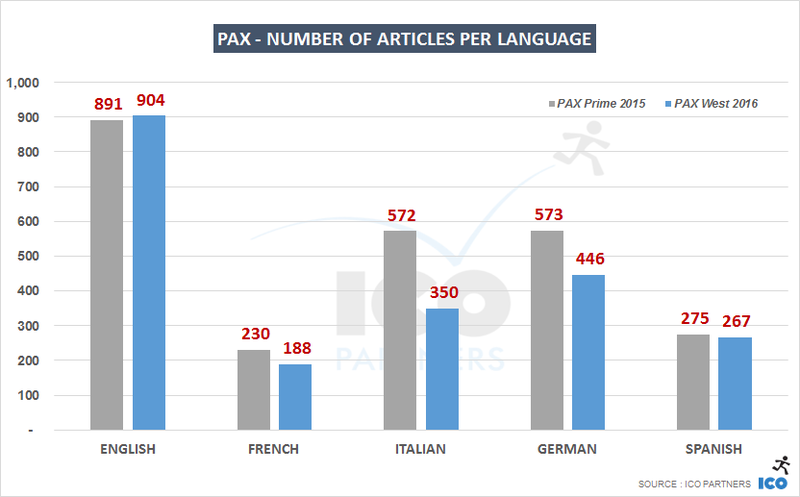 PAX being an American event, I was more curious about the coverage spread across different languages. 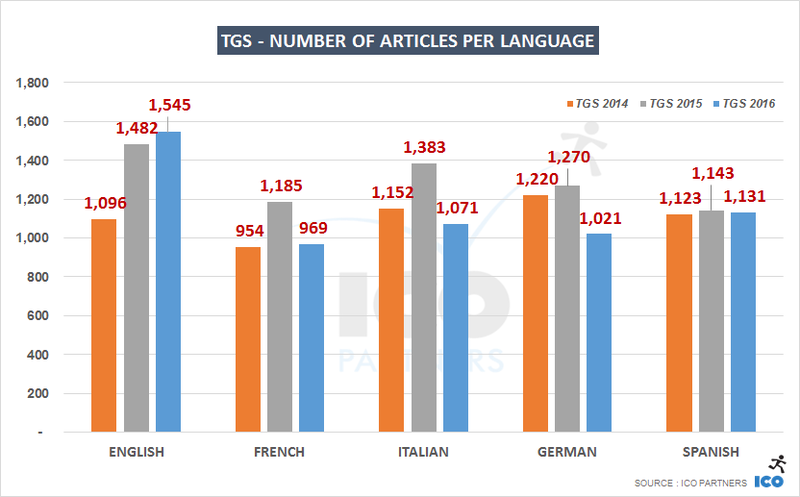 The year-on-year coverage stayed the same for English media, but there were fewer articles mentioning the event in Italian and German media. Looking at the media coverage, it seems there were fewer larger AAA games present at this year’s event, or at least, there were fewer announcements around the event. The fact that overall coverage in English stayed about the same should be seen as a sign that the event stayed strong despite fewer key news beats taking place at the show. Next in line, the main games event in Japan, the Tokyo Game Show (TGS for short) started on the 15th September. With Sony having its PlayStation Meeting earlier in the month in New York, it deprived the TGS from announcements that would have been done there in previous years. Sony still held a press conference during TGS, but it didn’t get as many headlines as the one from the previous year. The major announcements for 2016 were related to the Final Fantasy games, the new Resident Evil, and the controversy around the new Metal Gear title (and it being disavowed by Hideo Kojima). 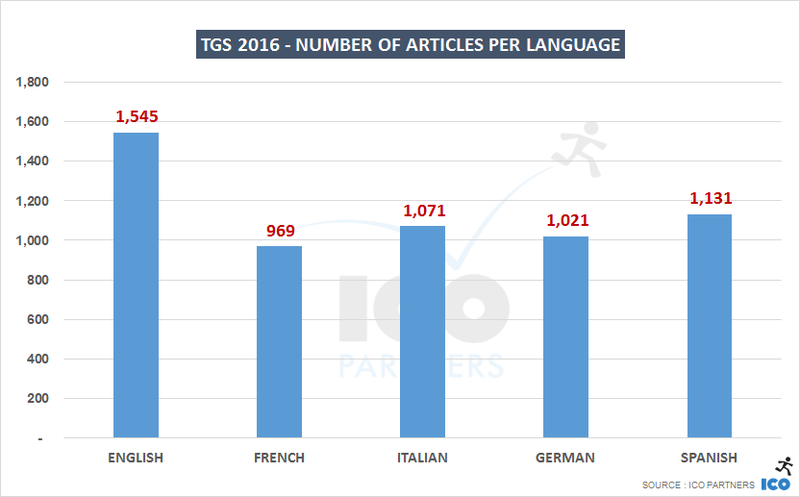 When looking at the EFIGS coverage, there is a surprising balance between the amount of articles referring to TGS in French, Italian, German and Spanish. 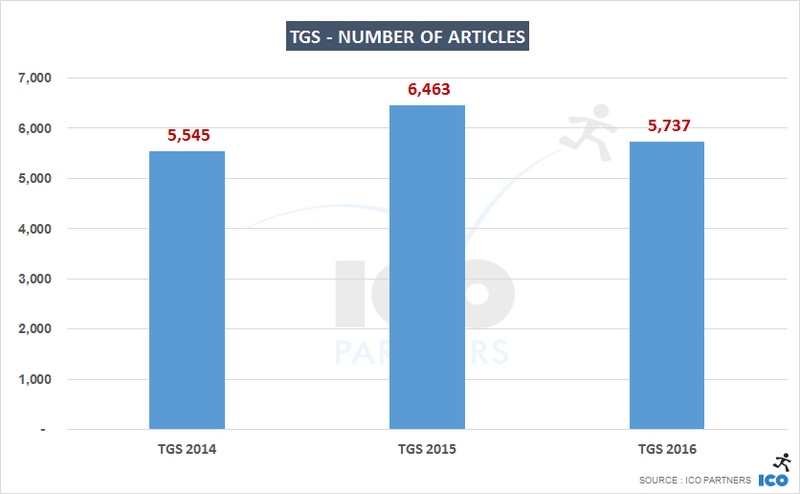 The international appeal of the TGS is clear when looking at the distribution of the EFIGS coverage. Interesting to note that the English media are the only ones that covered this year’s edition more than last year’s. Coming last in September was EGX. The event is very much geared towards consumers, but benefits from being the largest games event in the UK, with local studios using it as a platform for their own announcements. This year, the latest Yooka-Laylee trailer (that includes Shovel Knight as a guest star) was probably one of the biggest announcements tied to the event. After seeing a significant growth in coverage from 2014 last year, this year’s media mentions of the event saw a slight decline. EGX 2015 saw a lot of media attention due to some of the comments made by Sony’s president Shuhei Yoshida. 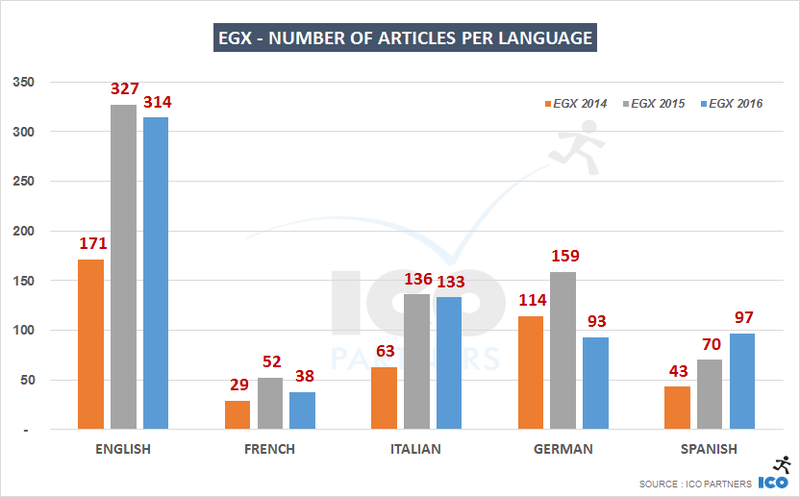 Unlike the more internationally covered PAX West and TGS, EGX is mostly covered and mentioned by English speaking media. The amount of coverage in French is actually surprisingly low considering that the event is still a vehicle for announcements that see significant relay in other languages. As a last exercise, I compared the actual number of unique English websites that covered each event, as a way to compare their reach and presence in that media landscape that is less reliant on the number of news beats relayed at the event. 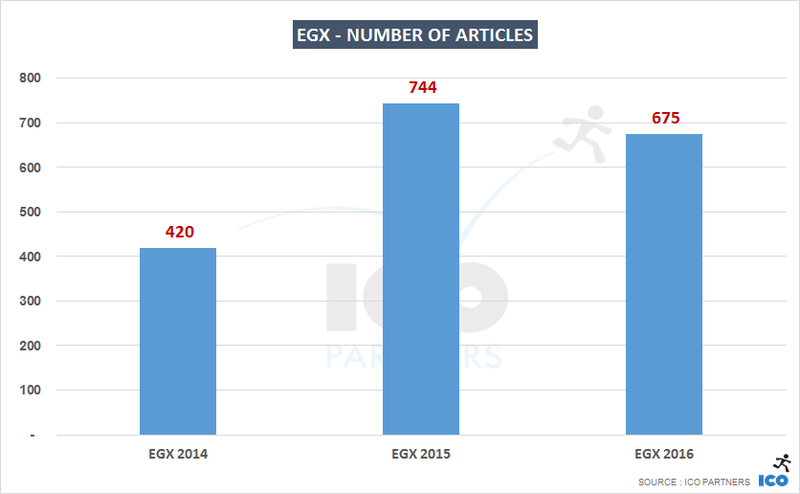 It is quite interesting to see PAX being at the level of TGS, and while EGX is significantly behind, it is not an insurmountable gap. 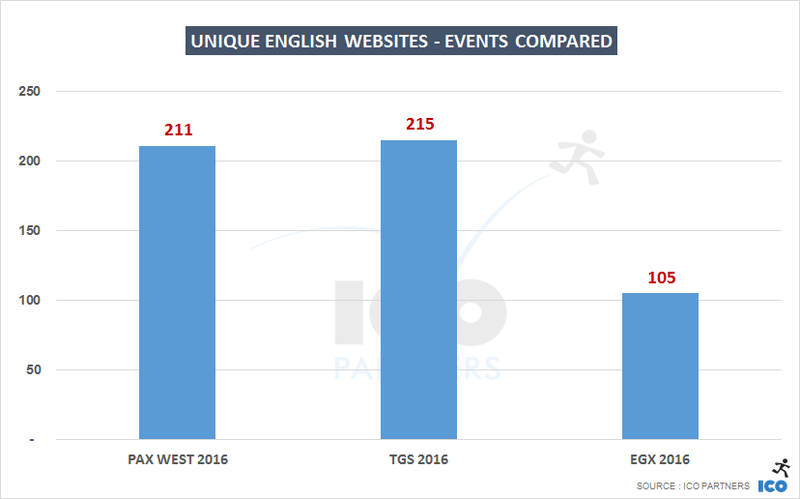 In 2014, there were 143 unique English websites reporting on TGS, by then already a very well established event. I can see EGX reaching similar numbers in a couple of years if they keep building their profile as a good platform for reaching media and the right people in the industry.